Scotch Farm, South Africa (CNN) - The bright morning sun lights up the children's faces as they watch the large trucks and buses maneuver through the narrow streets of the township of Scotch Farm on the outskirts of Grahamstown in the Eastern Cape. Their eyes are a mix of bemusement and delight as they watch the band of strange, but enthusiastic adults pour out of the vehicles with a vast array of cardboard boxes and lumpy bags. 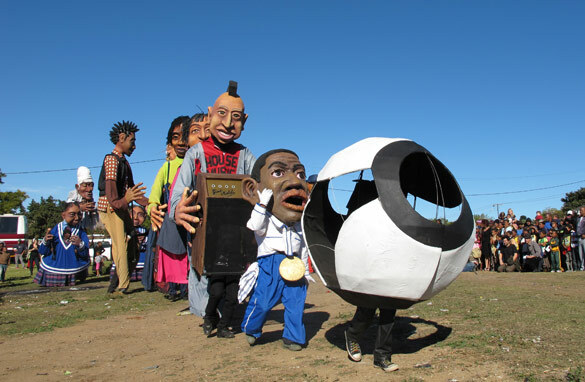 Watch my report on the giant puppets with a penchant for soccer. The people of Scotch Farm have benefited very little from the World Cup being hosted in their country. Poverty and unemployment are massive problems in this community and opportunities are scarce. That is exactly why this collective of French and South African artists has come here. The show is called "The Giant Match" and it aims at creating an artistic spectacle to match the excitement of the world's biggest soccer tournament. Just love that!!!! Congratulations to those who made this show possible!! There´s nothing more beautiful than a smile and joy upon a kid´s face! !